With autumn having set in around the country, it’s time again for the fall Baltimore show organized by Whitman, held this year from November 5 to 8. 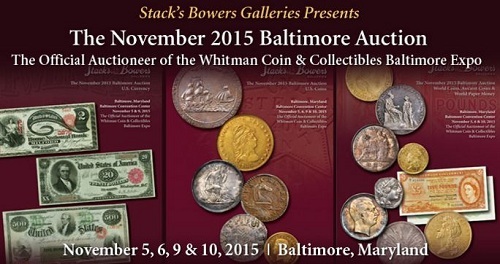 In conjunction with the show, Stack’s Bowers organizes several auctions, offering United States and world coins and currency, as well as several lots of numismatic Americana. In this preview, we will take a look at some of the lots in the U.S. coin auction. All lots, including those in the other categories mentioned, can be viewed here. PDF downloads of the complete auction catalogs can be found on the left-hand side of the page. Lot 20013: 1983 Lincoln cent, struck on a copper alloy planchet. The first lot we will examine is offered as lot 20013. At first glance, this looks like an ordinary 1983 cent just as might be in your pocket right now; in reality, it is an extremely rare error coin. Graded AU-58 by PCGS, the coin was struck on a copper planchet, the metallic composition of which had been discontinued in August of 1982, when the mints switched to a copper-plated zinc composition (1982 coins were struck on both varieties). Called a transitional error, the coin must have been struck on a leftover planchet that inadvertently made its way into the production process. Very few of these errors have been found in circulation, and it is unclear exactly how many were struck. 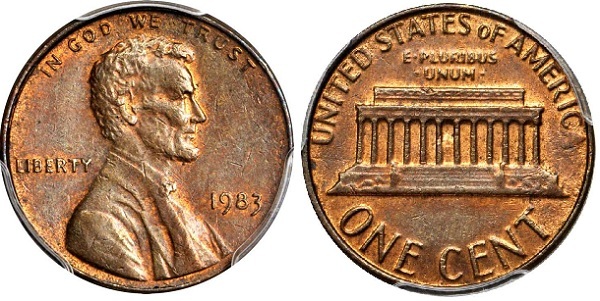 The physical appearance of the coin is virtually identical to a regular zinc 1983 Lincoln cent, but the weight is different, weighing the old standard of 3.1 grams versus the 2.5 grams zinc cents are supposed to weigh. This is a fascinating error piece that no doubt will attract considerable attention from error specialists. Lot 20033: 1900-O Barber dime. The Stack’s Bowers auction offers a small selection of extremely high-grade Barber dimes in both Proof and Mint State. Most of these are pedigreed to the Simpson Collection, which was sold in December 2014, and was considered to be the finest Barber dime collection ever assembled. One of the coins offered in this auction is the single finest known 1899 Barber dime, graded MS-68 by PCGS, and pedigreed to the Eliasberg and Gardner collections (lot 20033). The coin has an undisturbed pedigree that goes back to the Philadelphia Mint in 1899, where J.M. Clapp purchased it for his collection shortly after it was struck—probably exchanging an old dime from his pocket for a pristine, freshly minted example. Lot 20060: 1841 Liberty Seated half dollar. While coin collecting is a hobby that has been around almost as long as there have been coins, the collecting of contemporary United States coinage did not take off until the 1850s. 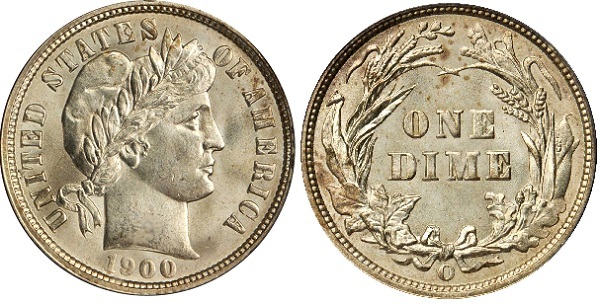 From then on, collectors often focused on Proof coins, mintages of which gradually increased. Proofs issued prior to 1857, however, often had miniscule mintages and are extremely rare. One such coin is offered as lot 20060, an 1841 Liberty Seated half dollar, graded Proof-65+ by NGC. A total of just eight Proof coins are known to exist, and the total mintage is unlikely to have been much larger. 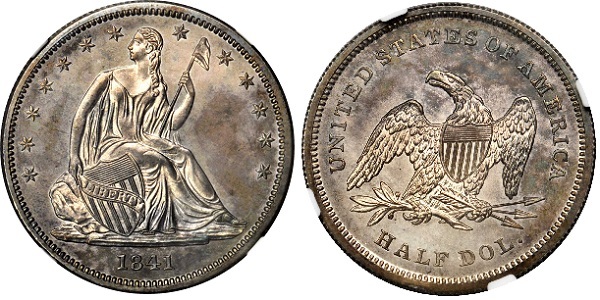 Of the small quantity of Proof 1841 half dollars available to collectors, the coin offered by Stack’s Bowers is the finest graded by either PCGS or NGC. Lot 20105: 1879 four-dollar gold Stella. The four-dollar gold coin is a denomination that never made it past the pattern stage, but it is often collected by advanced type collectors or gold specialists, thanks to its inclusion in the Red Book. Because of this, it is a very popular and expensive issue that often attracts a lot of attention at auction. Lot 20105 is such a coin, nicknamed “Stella” and graded Proof-65+ by PCGS. 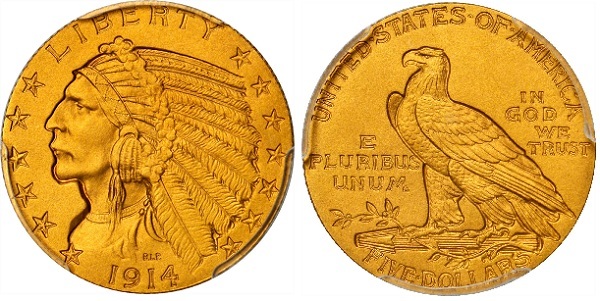 Four-dollar gold pieces are divided into four distinctive issues, dated 1879 or 1880, with a representation of Liberty with either Flowing or Coiled Hair on the obverse. The 1879-dated example offered by Stack’s Bowers features the Flowing Hair obverse, designed by Charles E. Barber. Initially, only a few dozen pieces were produced as pattern pieces, but in 1880 an additional 425 were supposedly struck. These restrikes are generally considered to be indistinguishable from the originals, although some research suggests there is a way to tell them apart by metallic composition. The coin offered in this auction is a fresh and fully original example; according to the auction catalog it has not been offered to the numismatic community since at least 1956. Lot 20119: 1914 Indian Half Eagle. The final lot we’d like to take a look at is lot 20119, a PCGS Proof-67 graded 1914 Half Eagle. Proof gold coinage of this period is extremely rare, due in part to declining mintages after the Philadelphia Mint changed the surfaces to a matte-like sandblasted finish, instead of the reflective surfaces of years past. This finish proved to be hugely unpopular and led to the discontinuation of Proof coinage (including copper and silver) after 1915, not to be reintroduced until the 1930s (the onset of World War I had its influence, as well). This particular issue had a mintage of approximately 125 coins, but many went unsold, and only three dozen or so are believed to exist today. These are just some examples of coins in this auction. The catalogs are worth perusing, with more interesting and rare items found in the currency and world catalogs as well. This auction is one of the last major auctions in the United States to be held this year and should give a good indication of the direction the market is heading as we move toward 2016.